The reason behind asking you to list ten things you are thankful for is to challenge you to look hard at your life, and discover both the big ways and small ways that you've been blessed in the past week. However, I don't want anyone to feel that they can't participate unless they list ten, so do the best you can, share as many as you've got, and don't feel the need to make excuses if you're short. We're just happy to have you sharing with us! When will the link-up be open? What are the rules for linking up? 1. You post should be related to the topic of personal gratitude (unrelated posts will be deleted). 2. Your post should include the TToT logo and a link to the TToT link-up. 3. You should read and comment on as many other posts as you can. The whole point of this blog hop is to share and to encourage each other... that's where the magic begins! Does the TToT have a Facebook page? 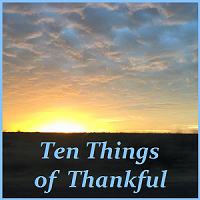 Yes, here is the link for our private Facebook group: Ten Things of Thankful. You are welcome to request an invitation to join us there.